Commercial kitchens and cafeterias generate a tremendous amount of waste, and the garbage bags that deal with all that trash need to be up to the job: badly handled food scraps can be a smelly health hazard. From small garbage bags to catch receipts by the register to extra large garbage bags for the giant bins out back, our bags will keep your kitchen running clean! Choosing the right commercial garbage can liners for your food business starts with the resin. 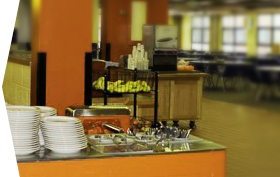 General cafeteria waste like plastic plates, cups and napkins, is easily handled lightweight and affordable high-density plastic. This plastic is thin but strong, and can hold heavy and wet garbage with ease, but it’s not designed to stand up to punctures. For kitchens throwing out sharper waste, like bones and skewers, you’ll want heavy duty garbage bags. Our thicker low-density bags are the best option. And of course, to help your business stay green, we offer a wide range of recycling garbage bags, including blue and clear trash bags. When you’re deciding on the thickness of your bag, remember that the higher the micron or mil measurement, the heavier the bag will be. Our bulk garbage bags are an ideal solution for kitchens, which always go through a large quantity of trash bags. Buying wholesale garbage bags from Plastic Place is the easiest and quickest way to cut down your supply costs without having to worry about a drop in quality. All of our bags are made from superior plastics, and are covered by our 100% satisfaction guarantee. We’ll help you choose the ideal garbage bags for your kitchen or cafeteria, and we’ll make sure you’re taken care of every step of the way.